Our client – a credit card issuer operating in the sub-prime loans domain in Eastern Europe reached plateau for their acquisition phase. Even though the portfolio is now rich as number of active customers these use the product only to meet their current need and leave shortly. A strategy to control the attrition rate is needed. Acquiring new customers is more expensive than retaining the current ones. We have developed a Churn behavioural prediction model that will significantly increase the knowledge of which credit card holders are about to leave the company. 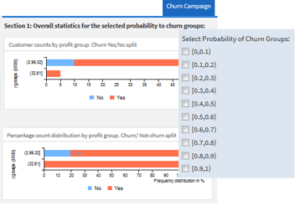 A full behavioural churn profile was achieved with the scoring model. Along with other metrics a CRM solution was developed to target and retain customers with tailored proactive offers. Enhanced with other metrics like time since first debt and current customer lifetime value. 30% better retention rate while AB testing live.